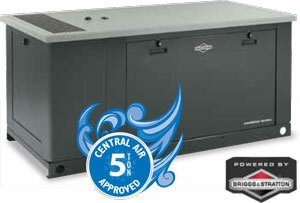 Ruud automatic standby generators provide permanent, backup protection from power outages for your home and family. Find the right generator for your home with flexible power solution options that allow you to select the level of backup power protection needed for your household. Covers your home’s basic circuits providing backup power to your lights, refrigerator, television, computers and other small appliances. 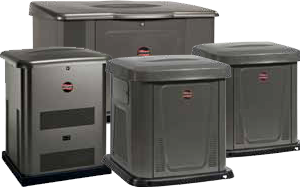 Tested against the tough NFPA 37 Standard, unlike other home generators on the market, Ruud air-cooled generators can be placed as close as 18″ from your home making backup power a reality for many homeowners–even those with tight lot lines. Flexible Placement* – Tested against the tough NFPA 37 standard, Ruud 8-10-12-16-20kW† standby generators can be placed as close as 18″ from the home providing more placement options in your yard — perfect for tight lot lines. Whole-House Comfort – Ruud 35-45-60kW† standby generators will supply enough power to manage up to two 5-ton air conditioners in addition to essential household power requirements. * Installation must strictly comply will all applicable codes, industry standards, laws and regulations. Running engines give off carbon monoxide, an odorless, colorless, poison gas so it is important to keep exhaust gas away from any windows, doors, ventilation intakes or crawl spaces. Caron monoxide must be installed and maintained in your home.